Have you been thinking about bringing your Occupational Hearing Conservation program in house but don’t know where to start? Download this free guide from SHOEBOX Audiometry. 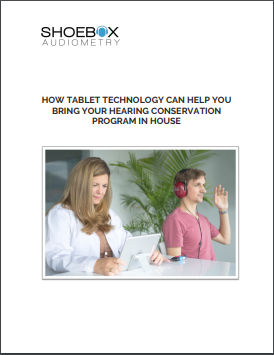 New advancements in portable, tablet audiometry and paperless data management are changing how Occupational Hearing Conservation programs are delivered. The technology is helping more businesses take back control of their hearing testing programs. Download this whitepaper to learn more about how you can too.